Applied Information, Inc., the leading developer of connected Smart Cities intelligent transportation systems, announced today in partnership with system integrator Temple, Inc., that they will supply connected vehicle technology, including bus rapid transit priority, to the City of Atlanta’s second Smart Corridor on Campbellton Road. 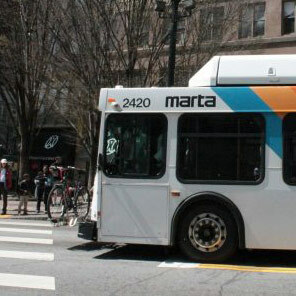 The Campbellton Road Smart Corridor will provide traffic signal priority to MARTA buses at intersections providing for more reliable travel times for transit riders. The technology will also provide motorists who travel down the corridor with access to the TravelSafely™ smartphone app which provides red light running warnings and “Get Ready for Green” alerts prior to lights changing from red to green. The Glance™ Smart Cities Supervisory technology will be deployed at 23 intersections along Campbellton Rd. from the Oakland City MARTA station to I-285. The area serves landmarks such as Fort Mac LRA,Tyler Perry Studios, Greenbriar Mall and the Oakland City MARTA Rail Station.